Hope House continues to provide Palliative Nursing care to our clients, as Swaziland celebrated World Health Day on the 7th April. The Global theme for the 2018 World Health Day is “Universal Health Coverage: everyone, everywhere” The wealth of nation is health. Millions of people die every year due to communicable and non-communicable diseases, and preventable diseases like AIDS, TB and Malaria. Over time, the delivery of prevention, treatment, and care programmes have evolved to provide a range of services- not just focused on HIV and TB. Through the provision of integrated services, the HIV response attempts to address peoples multiple health needs at different points in their lives, improving overall health outcomes and resulting in a more cost-effective and efficient approach. Tb continuous to be the top infectious killer worldwide, claiming more than 4500 lives a day, it is also, the leading cause of death among people living with HIV(PLHIV) attributed to one in three AIDS related deaths. We have Miliswa 5 years and Wamukelwa 16 months born with HIV and are fighting for life with various complications. The mother too is on ARVs and she has the burden of taking care of these little ones who are with very poor adherence. 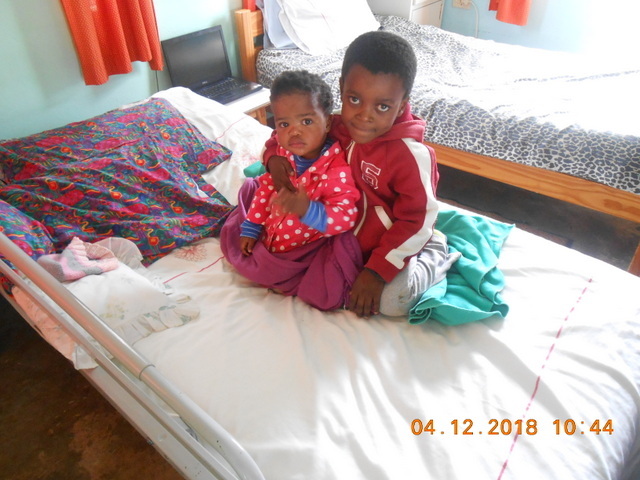 Today they had been to Baylor hospital Mbabane and found them in better health and will be discharged home on Monday, they have made a great improvement to be back home. The clients who were admitted at Hope house as patients were discharged home and now have come back as care givers. Some are still weak and need special care; two of our care givers were very ill and had to be admitted in RFM with various complications. Cancer & TB associated with HIV is a big Challenge, for which we are battling with. Mafika who was admitted yesterday is taken care by his wife and brother in in a critical condition, as he began to lose strength in his upper and lower limbs. He is unable to do anything by himself, he needs to be fed and washed; his brother does it with so much love and affection. He is on physiotherapy and medication, we hope and pray that he will recover soon. Mr. Almon is suffering from stroke since five years, he is admitted for Physiotherapy and has made much improvement, he had a fall in the toilet due to stroke, luckily he did not hurt himself but the whole toilet was broken and had to replace the whole things. The need of using a walker is often neglected by the clients, and they fall off everywhere as they lose their balance very often. 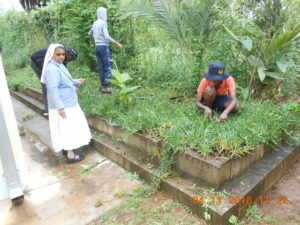 We have some students doing their community service at Hope House the clean around, visit the clients, spend time with them, play with kids who are admitted etc.